In April 2009, as renters looking for space to plant and tend a garden, my partner Jen and I attended a meeting about a program to lease unused city-owned land to green-thumbed folks like us. The idea was the brainchild of then-vice-mayor David Crowley, and it was part of the Green Cincinnati Plan—an initiative to address climate change and make the city a healthier place to live. Along with 30 or 40 other hopefuls, we heard about the selection process and the ins and outs of the fledgling (and needless to say, unfunded) effort. Larry Falkin from what is now the city’s Office of Environment and Sustainability talked about the testing that had been done by the EPA on the sites, looking for pollutants such as lead—a scenario that brought forth a barrage of questions. As did the water situation. At the time, southern Ohio was in a drought. How would an urban grower irrigate a city-lot-turned farmstead? The meeting’s master of ceremonies, somewhat exasperated, explained that participants who were granted one of the initial 15 available plots would need to work out agreements with neighboring property owners for access to water. “So you’re just supposed to knock on your neighbor’s door and ask them if you can hook up a hose?” someone asked, rather incredulously. Pretty much, we were told. That was all part of the “community building” component of the project. Clearly, growing on city land was going to be an adventure. Jen and I didn’t, as it turned out, get a city-owned plot. Our yen to cultivate found an outlet in an abandoned lot behind an artist friend’s studio. But as I yanked up honeysuckle, busted sod, and raked trash and makeshift drug paraphernalia from our beds, I couldn’t help but wonder how my comrades in this born-again urban experiment were doing. I know—city gardens have been around since cities began; market gardens once lined the slopes of our fertile river valley. But today they’re part of an urbanist zeitgeist, touted as a balm to environmental woes, a source of much-needed nutrition for poor families in blighted neighborhoods, and a way to put fresh-picked heirloom produce in the hands of farm-to-table aficionados. Thanks in part to the city’s pilot Urban Agriculture program, as it came to be called, Cincinnati is growing in ways that don’t involve pavement and parking meters. City farmers aren’t ready to take on Big Agriculture, but they’re giving us a taste of the possibilities—and problems—of life on the front lines of the Urban Ag revolution. I wanted to know what drives this new breed of grower—from the for-profit “market gardeners” to the dirt-loving backyard soloists whose passion for plants sends them back, year after year, to pour their blood, sweat, swear words, fertilizer, rain barrels, and tears into the earth. It seems like an odd statement from a guy who is showing us the sheep he raises. He even looks the role: tall, lean, with piercing blue eyes beneath a broad-brimmed hat. We’re talking at his home base, Homeadow Song Farm on Gray Road in Spring Grove Village. It’s an agrarian futurist’s reverie if ever there was one: Solar-powered, passively heated outbuildings sit on the four-and-a-half acre piece of land, along with a stocked fish pond, an orchard filled with fruit and nut trees, and a chic chicken coop that looks like it was designed by Frank Lloyd Wright. Huttinger is the coordinator of community gardens for the Civic Garden Center; as part of his day job, he organizes training and resources for city gardeners and has helped more than a few urban farmers find a place to plant. In 1984, Cincinnati was one of the first cities in the United States to conduct a computerized, comprehensive inventory of its vacant land—parcels abandoned by people leaving the city or forfeited by owners who couldn’t afford the taxes. Today, with planned demolitions, the city will soon have as many as 550 vacant lots. Some sites sit empty for years, too small or too unappealing for redevelopment. Huttinger searches to find spots that might become gardens. Which does not mean that every vacant lot can bloom. There’s a list of no-go’s. Ryan Doan was one of the growers who used Huttinger’s land-locating expertise. Doan grew up outside of Oxford, Ohio, and while other teens worked at McDonald’s, he baled hay for farmers and worked their gardens. After he finished school, he started a career in finance. But one day in 2012 something snapped—he couldn’t face another spreadsheet. Doan wanted to farm. He turned to the Civic Garden Center and Huttinger for help finding a place. Eventually the search landed him two sites in the East End where FEMA had turned flood plain land over to the city. Doan and his farming partner, Kevin Fitzgerald, got a three-year (free for now) lease on the land through the Civic Garden Center—a mutually beneficial agreement that saves taxpayers from footing the bill to have it mowed. Doan plans on giving back to the Civic Garden Center when their operation becomes more profitable. The sun is rising blood-orange through the haze one morning late last summer when I meet Doan and Fitzgerald at their site near the river—nine feet above flood stage, to be precise. “Everybody down here knows their number,” Doan tells me. Goldfinches hang from meaty sunflower heads, tearing out seeds, and hummingbirds whir at scarlet canna blooms. A chain link fence surrounds rows of pole beans, corn, kale, bell peppers, tomato cages, meandering mounds of squash, zucchini, and melon. The beds are built amid the remains of foundation walls—reminders of the homes and businesses that succumbed to past floods. Urban Greens—that’s what they call their operation—is very much hands-on; Doan and Fitzgerald, a former AmeriCorps worker, have the tans and physiques of men accustomed to hard outdoor work. They also share a passion for ecology, as well as the conviction that the more gardens there are around the city, the healthier the city and its citizens will be. Doan is proud that Urban Greens produce is grown without herbicides and pesticides, and pleased that the operation provides jobs for several summer employees. Eighty-five percent of their cash goes into labor, he says. “We knew we weren’t going to make a lot of money,” Doan admits. “We knew we were going to work our asses off. But we wanted to create something in Cincinnati that would be financially sustainable so that it could be environmentally sustainable.” Operations that fail financially aren’t going to contribute to environmental sustainability in the long run. So becoming an urban farmer didn’t save Doan from spreadsheets. The minutiae Doan tallies extend well beyond finances. He tracks the nitrogen, potassium, and phosphorus in the soil, and watches for diseases and pests. Big non-organic farms spread chemical fertilizers and pesticides over vast fields planted with a single crop. Urban farmers often must begin with poor soil and doggedly build its quality. I notice coffee filters and grounds in the compost bin; Doan says they’re brought in by a partner from Freedom Gardeners, who collects them from Starbucks and Lookout Joe several times a week. He points out where espresso grounds are applied directly to the soil for a quick nitrogen fix and sprinkled on lettuce leaves as a slug deterrent. Leaf and wood-chip mulching helps retain moisture and control weeds. Instead of chemical fertilizers, they resort to fish emulsions, worm castings, and compost “tea”—a murky mixture of water, plant matter, and beneficial microorganisms that helps to fertilize and control pests and plant diseases. Aside from vandals, the rules don’t always favor urban farmers either. According to the community council in the East End, compost is only supposed to be generated on-site, not carted in—which is obviously difficult within city limits, where it takes a lot to improve less-than-ideal soil. You can see where the rules came from: Who wants to live next to a truckload of rot? That said, properly aged, organic materials need not be smelly. And then there’s the question of aesthetics. Gardens might look great to some, but not everyone sees their beauty. Doan and Fitzgerald screen their lots from view with tall sunflowers, cannas, and castor beans, which serve as camouflage. When the weather is dry, Urban Greens irrigates with city water. They got help with the $7,000 cost of putting in water hookups from a grant administered through the Office of Environment and Sustainability. In fact, the biomass of city gardens actually lowers the amount of storm water entering the city’s system. During the growing season, you can find Urban Greens produce at several farmers’ markets. But like many other small growers, Community Supported Agriculture (CSA) participants are a huge part of their business. Urban Greens’ CSA members pre-pay for a growing season’s worth of produce, which they get in weekly increments. A share costs $600 at Urban Greens—up-front cash that makes it possible to plan for the coming year and make capital improvements to their farm. Their members also have the option of working in the gardens for a discount on the produce. Last year Doan paid $7 an hour for CSA participants’ labor; this year, he’s giving his customers a raise to $10 an hour. Crops do sometimes fail; other years they might exceed expectations. The inherent uncertainty of small-scale organic farming means that Doan and Fitzgerald are in constant communication with their customers: face-to-face at markets and CSA drop-offs, and through social media. Open communication, Doan says, helps manage expectations, allows participants to plan, and distributes information on what to do with, say, a bumper crop of zucchini. 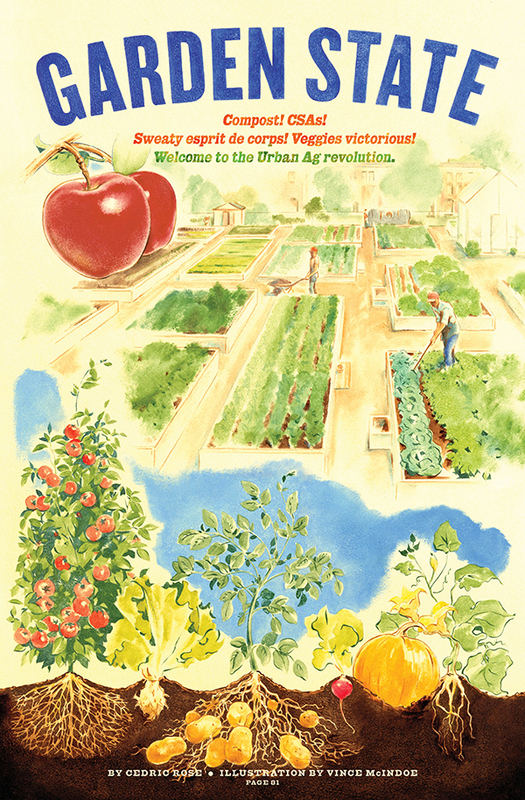 On North Bend Road just west of Winton, the Bahr family has been “urban farming” since 1916. Bahr Farm is a last vestige of the city’s agricultural heritage; the area was named Wooden Shoe Hollow after the Dutch settlers who built greenhouses and supplied downtowners with fresh veggies. The farm’s 30 acres stretch south of North Bend to the edge of the ridge where 16 head of cattle pasture overlooking the Mill Creek Valley. The farm has recently slaughtered three, to sell some grass-fed beef. Past and present seem to collide here—the crops and cattle contrast with the skyward curves of the Channel 64 tower, so close that we can make out rust streaks on its girders. Our Harvest Cooperative, a worker-owned farm that grows and sells produce for their CSA program, as well as institutions, markets, and wholesalers, now operates a four-and-a-half-acre incubator farm on the Bahr property, along with plots in Wooden Shoe Hollow. They’re connected with a worker-owned economic collective, the Mondragon Corporation, which originated in the Basque region of Spain. Our Harvest ensures a working wage for employees—at least $10 an hour, plus a monthly health-care stipend. Now in its third year, it is consciously positioned as a food hub for College Hill, a community that hasn’t had a major grocery store in more than a decade. Our Harvest, which already has 200-plus CSA members, also serves as a hands-on agriculture lab for Cincinnati State’s Sustainable Agriculture Certificate Program. You’ll find its produce at Pipkin’s Market and Country Fresh Farm Market. If you’re a Cincinnati locavore, chances are you’ve eaten something grown in the rich, dark loam of Bahr Farm. Soft spoken, squinting under the brim of a baseball cap, grower Jules Brookbank leads us around the farm and gives us some background. The soil of this long-standing farm is already particularly fecund, having been fertilized by a century’s worth of cow manure generated on-site. Brookbank explains that the transition from traditional farming to organic is tricky. “As soon as you stop using pesticides, the bugs are like ‘Oh yeah,’” he says, pulling a leaf of lettuce and munching it. Likewise, the land has a substantial, as he puts it, “weed seed bank,” meaning that Our Harvest either has to invest days weeding beds, or propagate seedlings in greenhouses, transplanting them into beds where weeds have already been suppressed. But taking over part of an existing operation has distinct advantages, such as an existing customer base. Their produce already has a following. Bahr Farm’s collards and rare black mustard greens have been a favorite of local residents for generations. Like Urban Greens, Our Harvest must calculate how to squeeze as much production out of their farm plots as possible. This means multiple plantings throughout the year and having greenhouse-grown seedlings ready after the last frost—a labor-intensive effort that begins in winter, when there’s no money coming in. Hooking up financing for an urban farm is difficult. Last August, Our Harvest was able to secure a capitalization loan from Farm Credit Mid-America and CoBank, a cooperative bank created by the merger of rural banks founded during the New Deal that specializes in lending to agricultural enterprises. According to Ellen Vera, Our Harvest board president and CEO and cofounder of the Cincinnati Union Cooperative Initiative, the money will enable them to scale up production and expand their customer base into schools and grocery stores. “If we can stay on track with our business plan, in the next four years we should be able to have about 200 people working,” Vera says. The benefits of the loan are tangible; a new tractor stands at the edge of a field just a few hundred feet off North Bend. With specialized implements, the tractor saves valuable time and labor, Brookbank says, pointing to the laser straight rows tilled by their new machine, all tightly wrapped in plastic to prevent weeds from competing with young crops. Our Harvest may have a people-first business model, but they’re not ignoring technology. Yet even an effort as ambitious as Our Harvest seems easy to dismiss in the big picture of food production. What are a few scrappy urban farmers when there’s a global population to feed? In fact, urban agriculture might literally contain the seeds for a better tomorrow. In our technologically advanced western society, it’s difficult to imagine a catastrophe like famine. But food shortages do happen, especially when populations rely on uniform crops that can be quickly wiped out by a single disease or sudden climate change. Urban farmers’ small-scale gardens can play a role in maintaining the genetic variation that is nature’s key to survival. Consider the current popularity of heirloom crops—old varieties of fruits and vegetables that were grown before hybridization transformed farming. A city plot helps protect an heirloom’s lineage: cut off by brick walls and vast expanses of concrete, they can’t cross-pollinate with commercial stock. And even if an apocalyptic shortage never comes about, small-scale farming provides food security on a personal level, given the recent surge in fresh produce prices. Carbon footprints, hours spent working the plot, and net price are quantifiable. But a lot of what you get out of farming, urban or not, still defies quantification—like the unique terroir of a particular variety of heirloom tomato, or the way that the plants we grow connect us to our environment and to one another. At their home on Chase Avenue in Northside, Dan Hart and Katie Brenner frequently provide neighbors with eggs produced in a back yard chicken coop surrounded by squash, tomatoes, and pole beans. You name it, Brenner probably grows it, and zealously collects and saves its seeds—in part because she loves delicious tomatoes but also for the connection these seeds provide to her heritage. Brenner’s great uncle Nick, a stonemason who immigrated from Romania, got her started. When he tasted something he liked, he kept its seeds. Once, on a job site in Delhi, he collected seeds for a particularly prolific cherry tomato. She’s still growing them. And on a trip back to his dad’s property in Romania, he brought back the seeds to a tomato that doesn’t mature until September, and will ripen slowly indoors to a pale-yellow blush. Home-grown fresh tomato and grilled cheese sandwiches in February are great, but it’s that sense of connection that drives Brenner back, year after year, to fighting tomato blights, vine borers, and cabbage moth. One purpose behind the Urban Agriculture pilot program in 2009 was to put derelict lots to use. But as the economy improved and developers’ interest in the inner city blossomed, urban farmers have discovered just how tenuous their hold on the land really is. In early 2013, two established community garden projects—OTR Homegrown and Permaganic—were threatened. Developers interested in building a parking lot scouted OTR Homegrown’s current site near Findlay Market, a spot that the growers had relocated to from their original site on Walnut, which they were forced to leave when the city slated it for a development project. And Permaganic—located just north of Liberty along Main Street, on the slope leading up to Liberty Hill—had been scoped out as a potential site for CiTiRAMA, a partnership between the city and the Home Builders Association of Greater Cincinnati to build and show model homes. It’s easy to see why Permaganic’s site was seen as ideal for CiTiRAMA. The gentle hillside field behind the recently remodeled Rothenberg Preparatory Academy looks out over the undulating Italianate cornices of Over-the-Rhine and the city skyline. The day I visit, it’s a hive of activity. Luke Ebner, who founded Permaganic with his wife Angela, directs four kids from the neighborhood as they mix an enormous barrow of wheat bran with molasses to create a (relatively odorless) form of compost called bokashi, developed by a Japanese farmer. It smells like bread as their shovels thump rhythmically. Meanwhile an intern works to erect a high-tunnel green house out of hoops and plastic for the coming winter. Permaganic—you might have seen their smoothie stand at Hyde Park Farmers’ market, or their pedal-powered mobile produce cart downtown—compensates the kids who volunteer here through sponsorship funds. “You’ve got to do what you’ve got to do,” one of the younger teens says. As I’m leaving, the young man tells me the reason he came back. “This is a good place,” he says. Permaganic and OTR Homegrown got reprieves last spring, though both situations are still officially unresolved. But the established fig and peach trees around the garden, and the pavilion that shelters and shows the work of these teenage farmers have become part of the landscape; they’ve taken root. Mark Stegman, one of the founders of OTR Homegrown, the community garden near Findlay Market, points out the irony of urban agri-improvement: “You’re building community and making it good for investors to then come in and buy it,” he says. Another cofounder at OTR Homegrown, Tevis Foreman, is also the Director of Urban Farming under the Cincinnati Health Department. Foreman says there has been a lot of support in the past few years from local and national government; today, Cincinnati’s Urban Agriculture program has a modest budget. “Nationally, the cities that are thriving with local food production and sustainable use of the land have seen positive health impacts,” he tells me. “All have the support of institutions and agencies that are working in urban agriculture, whether they’re governmental agencies or nonprofits.” So while profitability remains important to spreading the small-scale model of the urban farmer, no one can make it on their own. In Early fall, I pay a visit to Urban Greens’ Wednesday market in the parking lot of dunnhumbyUSA downtown. In the shade of a highway overpass, tables display baskets of greens, purple potatoes, and orange and yellow tomatoes. A boom box plays Neil Young’s “Keep on Rocking in the Free World” as workers, dazed by the lunchtime sunshine, peruse the wares. Ryan Doan is here, greeting customers and helping with sales. One shopper is looking for some red potatoes she had the week before. “They were really good,” she says. It seems a fitting end to a successful season: a customer with brand loyalty. Over the winter, I catch up with Doan to see how plans for next summer are coming along. He tells me that Fitzgerald, his business partner, has decided to move on to a better-paying job at Miami University. But Doan remains optimistic. He’s found another partner, and there’s a new site and revenue stream: a free (for the time being) lease on 10 acres near Newtown where he’s starting plants in hoop houses and expanding into the chicken business. He’ll be selling eggs as well as heritage chickens to homeowners interested in setting up coops in their backyards. So even when Doan’s growing season is over, his work isn’t. Even when empty rows are mulched with shredded leaves he’s planning his gardens, budgeting for workers, promoting his bounty to potential CSA participants, building relationships with corporate customers, and fretting over spreadsheets. The soil will rest through the winter, but the city gardener never sleeps.